would be happy to provide a free estimate. Please refer to the FAQ for more information. 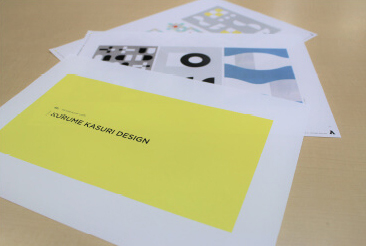 What are the characteristics of Kurume-Kasuri fabric? Kurume-Kasuri fabric is 100% cotton with a width of about 38 cm, the width of a kimono. As the thread is knotted and the pattern is dyed in multiple colors to form the design, there is no particular back or front side. It is woven on an old power loom whose parts are no longer sold. Is the dyeing done with indigo dye? People associate Kurume-Kasuri with indigo dye, but at Sakata-Orimono we mainly use chemical dye with good color adherence. As a result, there are rich color variations and the possibility of wide-ranging designs and color patterns. Do you have production lots? The minimum lot is basically about 288 meters. If pattern designs have high versatility and are easily incorporated into our plans, a minimum half lot of 144 m is also possible. However, a plate charge of 10,000 yen (pre-tax) will be applied to all first-time orders. Are there any limitations to the pattern designs? The design can be envisioned as the repetition of an image that is about the size of a sheet of A3 paper (29.7 cm x 42.0 cm). However, sometimes too-fine, delicate lines or too-detailed patterns of 10 mm or less aren’t able to be made by the power loom. How much time is needed to finish weaving the fabric? From design to production (including meetings), two to three months is necessary for totally original patterns. Please note that May through July and October through December are our busy periods, so delivery might take a bit longer during those months. 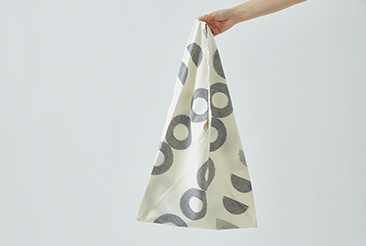 Besides creating the original fabric, do you also sew items such as fashion accessories? We can provide this service, but our sewing schedule is booked up to two months in advance. If you have some flexibility regarding delivery time, we would be happy to discuss this option with you. What is the approximate price of the cloth? It depends on the thread being used and the complexity of the pattern. As a point of reference, market rate (reference retail price) for about 12 m of cloth ranges from 25,000 yen to 38,000 yen (pre-tax). 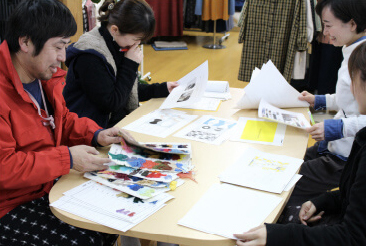 In addition, an initial plate charge of 10,000 yen (pre-tax) will be applied to all original fabric production. ※ Please feel free to contact us with further questions.In some cases, response via email may take some time. We held a meeting at our office regarding the production schedule, etc. During ALLd.’s visit, they were able to observe the Kurume-Kasuri production process. We received a request for several patterns, and began design creation, thread acquisition and production preparation. 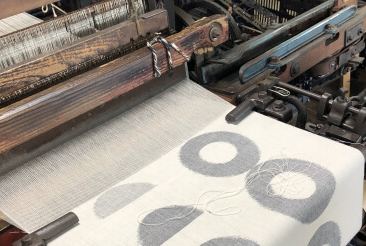 Weaving work is a multi-step process. The beautiful fabric is finished!